We're looking here at John Clinton's cylindrical wooden flutes to see what similarities and differences there are when compared to his conical systems and his metal cylindrical flutes. The most immediately obvious difference is the colour of the timber, the lower flute is in unstained cocuswood, the former is also cocus but has been stained. Perhaps the next most obvious difference is that on the lower instrument, the G# key cup is in line with the other key cups, rather than being at the end of the L4 key on the side of the instrument. It's still operated by L4, but through a linkage rather than directly. It's also operated by L3; the arrangement and reason for this will be shown below. 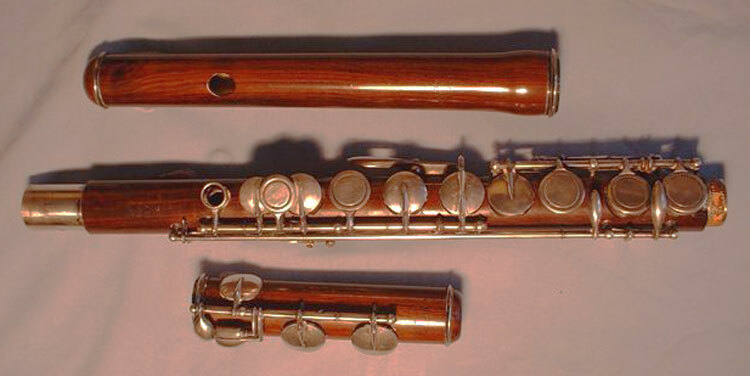 The top tenon on the body of the lower flute is unusual too, in not having the tenon cork seen on the upper flute. It's possible that this is due to a repair. The tenon cork isn't really needed here, as there is a telescoping tuning slide built into the inside of the tenon and socket. 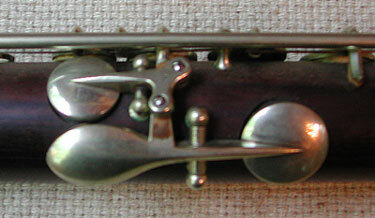 This flute shares a characteristic feature with many other of Clinton's flutes - the single thumb lever which can play either C or Bb, depending on whether the top keys are being fingered B or A. The characteristic is common, but the method of achieving it varies. In this model, the logic is performed by a side mounted C-key, driven by the thumb key and by the tail of the B key (see schematic below). Perhaps the most unusual feature of these flutes is the size of those key-plates, and presumably the holes under them. And the fact that they taper from small near the top of the flute to absolutely enormous at the foot. These are in fact the "graduated holes" of Clinton's 1862 Patent. To find out how the thing really works, we turn to a schematic drawing of the mechanism, shown below. The note names at the top of the drawing tell us which note will be played when a key cup directly under that name is the first to be opened. The home positions of the fingers are shown as L1 to 4 and R1 to 3 (R4 being used on the foot keys). Note that there is no hole under L2, L3 and R1 - they are just touches. All the other key-cups have pads and holes under them. Note that the schematic relates directly to the lower instrument pictured above. The upper instrument has the G# key-cup directly on the other end of the L4 lever. On that instrument, L3 closes only the A hole, there being no linkage to the G# cup. The benefit of the arrangement shown is that full venting is maintained for all fingerings (ie every hole below the first one opened is kept opened). R4 operates the foot keys (not shown). R3 can also open Short F (touch between R2 and R3). Unfortunately, I do not have bore information for either instrument, other than to note that the body bore is around 19mm. We can be pretty confident that it adheres closely to that of Boehm's 1847 cylindrical instrument. Many, perhaps most makers in the second half 19th century made flutes - either simple-system, multi-keyed or both - based on Boehm's bore, most stickling very closely to the original dimensions. Indeed, only those that deviated significantly from Boehm's pattern seemed to get into trouble. Boehm had done his homework well. Given that assumption, we can guess that the head bore at the stopper starts around 17mm, and expands to 19mm more or less linearly over the next 130mm, remaining at that diameter for the rest of the bore. As you can see, lots of work to be done yet! Special thanks to Helen Valenza, USA and Andrew Kirby, UK, for the opportunity to explore these instruments.